When asked for their favourite directors, few anime fans would omit the living legend Hayao Miyazaki. It’s now been several years since I went to The Barbican to see what must have been one of the only UK screenings of Princess Mononoke, and I was instantly besotted. Since then, I’ve seen all but one of the great man’s films, and probably the majority of those produced by Studio Ghibli, which he co-founded. 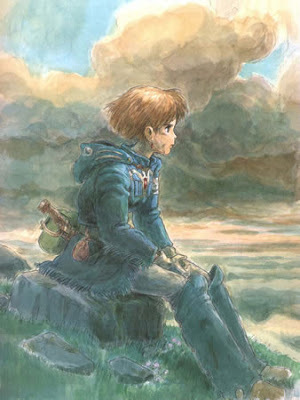 But this is where it all began, with Nausicaä of the Valley of the Wind. Miyazaki had won some acclaim as an animator, even directing a Lupin III movie (the aforementioned lone film), but it was with this manga that his writing was shown for the first time, and where he had total creative freedom. Begun in 1982 and not completed until 1994, Miyazaki adapted the first volumes into an anime movie, which I watched several years ago and found rather less gripping than his usual work, lacking the crucial human element that makes him so appealing. Nonetheless, after hearing the manga called ‘The greatest graphic novel of all time’ in more than one place, I gave it a try. Humanity is in turmoil. After an age of great technological progress, warfare razed the land, and suddenly giant forests of poisonous trees and fungi sprouted up, and with them huge insects like the vast maggot-like ohmu. In a valley near the brink is a small village, where Nausicaä, daughter of the chieftan, lives in harmony with nature and with the love of her people. Flying with her ‘Mehve’, a personal glider of sorts, she finds an airship that has suffered heavy damage under attack by forest insects. She attempts to save those inside, but her actions eventually lead to her becoming involved in a war between two powerful countries, so involved that she becomes the only one who can free humanity from its restraints. Nausicaä is very long, and to be honest, like the god warrior Ohma, it seems to be falling apart, unable to hold itself together. Miyazaki is clearly a skilled artist, but his style doesn’t appeal to me, despite how keenly I love the character designs of his anime work. For one thing, the pages don’t flow well. It’s not just that he keeps his boxes square and doesn’t seem to want to use the sort of techniques manga artists like to incorporate to suggest pacing (cutaways, for example): he just seems to move from place to place, person to person, scene to scene at will, which is unsettling for the reader. It doesn’t help that a lot of his characters look VERY similar. This is true of his anime, too, but they have much smaller casts, and don’t look nearly as alike as all the ‘young-looking’ characters do here (eg non-grotesques). He likes including silly facial expressions, and while they’re perhaps quite naturalistic, they tend to spoil the mood at times. And the story just meanders about too much. Political intrigues between different nations, great long pedagogical speeches about environmentalism (the preaching really started to grate), lots of battles between men and men or men and monsters (most of which were pretty silly), diversions that took place entirely in the mind and nice scenes of home life – all crammed in. Some were better than others, and some minor characters really made a strong impression…but the propensity to build up some powerful villain only for them to be dispatched flippantly can only happen so many times before it gets annoying. I think the last chapter, a truly thrilling, cinematic climax, was the only one I wholeheartedly enjoyed. And the fact is that I just didn’t like Nausicaä. She was just too perfect. Too universally loved, too flawless, too bland. She can fight, she can understand animals, she can fly like none other – it was just too much. Plus she felt like a mouthpiece for idealism, like she could never be wrong, and that just made her seem like less of a character, more of a vehicle…like a pretty little wagon with schoolbooks piled up inside. Mononoke-Hime explores similar thematic ground, only with better characters (most of whom look almost identical to SOMEONE in Nausicaä), much more interesting setpieces and a whole lot less cliché, despite the overblown ending. Nausicaä is far from Miyazaki’s best, but certainly noteworthy as a stepping stone I can only be grateful he took.